We're saved by the free gift of God - but how free is that gift when our lives are demanded in return? Many Christians are confused by the relationship between the grace of God, and the role of laws and commands in the Christian life. What does it mean to live a life of grace? How does grace help us grow? And are we "once saved always saved?" 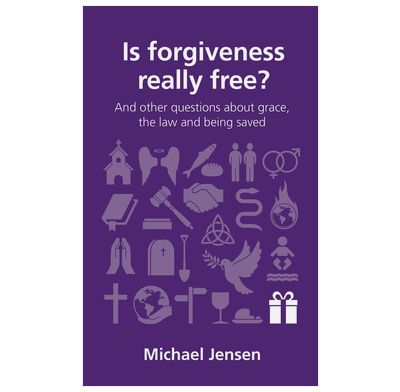 In this short, readable book, Michael Jensen explores the Bible's teaching on these important questions and delivers some surprising conclusions. Download a free discussion guide to help you reflect on each chapter as you think about God's grace on your own, with a friend or in a group. 1. Is forgiveness really free? 3. If it's free, is it worth anything? 4. How does grace change me? 5. What place does OT law have in the life of grace? 6. How does grace change us? 7. Why does God give grace to some and not others? This little book grapples with the issues of grace and the law. It is written fairly simply so would be useful for a new Christian hitting these issues for the first time. It isn't long enough to develop the issues, for example, the last chapter on "how bad are human being really" majors on the Pelagian heresy and Augustine's response rather than a clear biblical explanation of our total inability to help ourselves in any way to even respond to God's grace (total depravity). Nevertheless there is some clear teaching in the chapters on whether grace is free and what the place of OT law is.